Here is an unposted look from weeks ago when we had been blessed with Summer for about... two days? I've also got another cute piece from Goldie that I'll keep until warmer days. Meanwhile thinking of getting my hands on this beauty here. Love your pants. You look amazing. Beautiful shots! Love the outfit in motion...really shows off the playful spirit of this ensemble...your hair is killer, totally lustworthy! love the skirt, great print! That skirt is divine! You look so pretty and free-spirited. that hair! that hat!! love these pics!!! I love it! All the outfit, the colors, the move of the hair! PERFECT! Beautiful skirt and worn exquisitely. Love it!!! You look amazing! Such a great outfit! wow the photos are A-May-zing!!! Beautiful look again ^_^ The pattern is gorge! What a beautiful skirt and pictures! 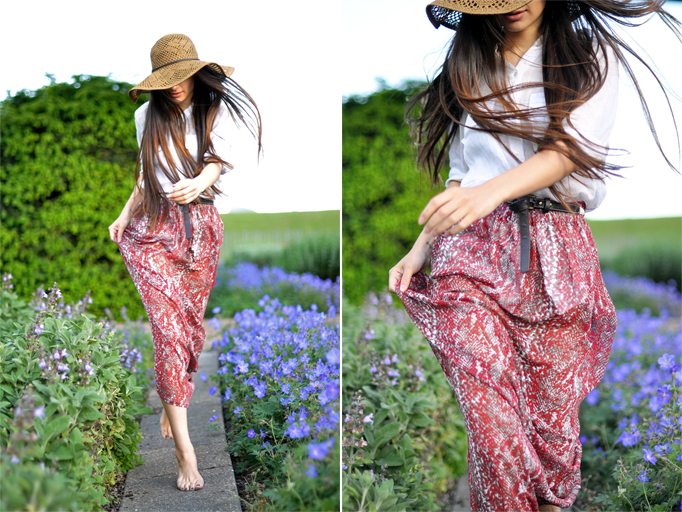 I am in love with long skirts this summer, they are super comfortable! MOVE ITEMS TO BE ADDED SOON! OMG I just fell in love with this outfit! it's so beautiful, light and perfect for summer! This skirt has such a beautiful pattern! those are too cute! The pattern is gorgeous!! very pretty pics! and I love those pants!